You can integrate with third party form providers such as Unbounce, Gravity Forms and Contact 7 to automatically generate leads in SalesSeek. Using the steps below, you can quickly get integrated with your preferred third party form application. Once the form is submitted, a new led is generated within SalesSeek, populated with the given form data (e.g. name, company, email). You can capture any information you require but may have to add some custom fields if the form is particularly complex. Step 1) Configure your chosen third party form provider with the fields of your choice. 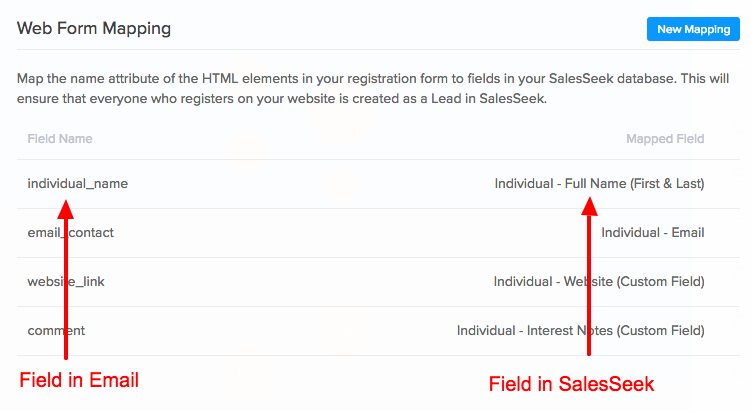 Step 5) Map the fields that are being submitted in the form into the related fields in SalesSeek. You can set up the fields in the email in whatever format you wish, but the exact same text must be used when mapping the email field into the appropriate field in SalesSeek. Question) Do I have to map the lead source? Answer) No, it will automatically show as 'Web' but you can change it if you need to by selecting a different lead source in the dropdown. Question) Can I automatically create a 'deal' for each newly submitted form? Answer) Yes, you need to map the 'Deal Name' field with an appropriate field in the submitted form (try name or company etc). Question) Can I track different forms on my website? Answer) Yes, you can map as many different forms as you require on your site. 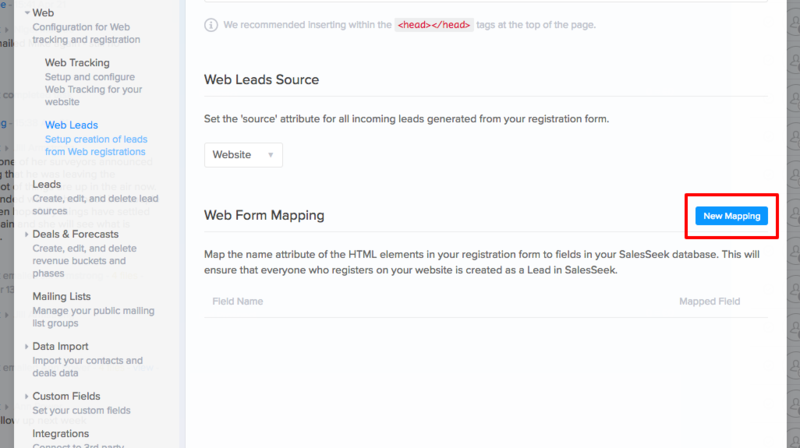 These will all have the same lead source, to keep track of different forms on your site, make use of hidden fields within the form and map it's content to a field in SalesSeek.